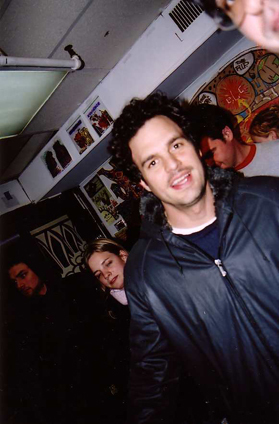 the very cool and endlessly, totally talented, MARK RUFFALO – dropped by the closing party for the ENDLESS LOVE CREW (ELC) live painting jam, at Chashama Center Gallery, on 44th Street in Times Square, NYC, March 25, 2006. He was in rehearsals for his starring role in the new presentation of Clifford Odet’s 1935 ‘Awake and Sing’ at the Belasco Theater, directly across the street. CELSO one of the organizers of the ELC event, said Mark was a real fan of street art and had been dropping by on a regular basis throughout the week of the ELC live painting event. 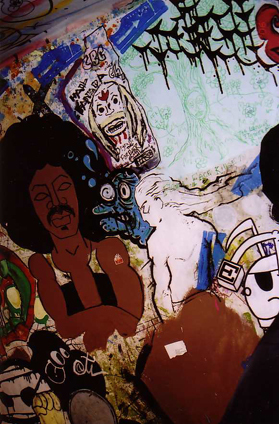 the dude with the afro-puffy is by Celso – ENDLESS LOVE CREW (ELC) live painting jam, Chashama Center Gallery.